I have about 100 volunteer applications on my desk this week. Since I manage volunteers in 2 libraries, I have them sorted on 2 clipboards. It’s almost like having twins. I need to treat them both fairly. I get more walk ins at the library where my office is, but the volume at the other library seems to be more so the placement there is more urgent. This is the Human Resources part of Volunteer Management. 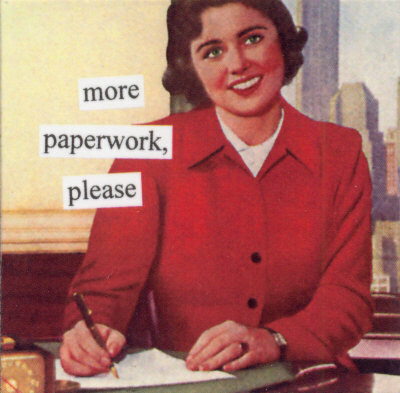 How do we keep up with the mountains of paperwork that comes along with the job? I put together a manual of my job. In it are all the forms, agreements, master copies, and the “why’s” and “how’s” of what I do. It’s a big binder. Lets just say, if I need a step stool to reach something, I can just stand on it for height. As for the volunteers, attached to their application is their handbook consent form, any letters or notes, copies of probation or school related forms, any special waivers, their resumes if they have submitted that and any other information that find their way to me while they are currently volunteering, such as time sheets. Those are all the current ones. As for keeping previous volunteer information. Let’s just say I keep it all. I had a call about a year ago from a volunteer who needed her time sheets to prove that she did volunteer to the IRS during an audit. She claimed her mileage, which was allowed, but she needed the paperwork for her accountant. Luckily I had it. It was buried in a drawer, but I had it all the same. I’m excited for 2010. I’m going to move all the applicants and current volunteers to an access data base. That way if we need volunteers to repair books, and they checked that box on the applications, I can pull everyone up. I mentioned Volgistics in an earlier post, and hopefully that will help me track hours better and have better communication with the volunteers via the web. I don’t want to go paperless yet, but I need some way that will help me organize better and stay on top of it all. I Need Info Quick Chick! Who is this Volunteer Manager Chick? Certification in Volunteer Management Don’t let anyone tell you that Volunteer Management is not a big deal! It’s HUGE! Habitat for Humanity Book Nerds like to use their hands too! Hot Library Tech High School Drama and AWESOME Displays! Librarian Woes…Poor fellow! This guy bailed out, but some of his older stuff is great! library stories This Director loves her Ohio Library! Meals on Wheels You don’t have to work at a library to do Mobile Outreach! Smells Like Library… Not sure what his library smells like, but my office is all chocolate and cherries! Thanks and Happy Holidays! Send a Holiday Greeting to a Soldier! Volunteer Managers A great link for Volunteer Managers of ALL KINDS! ROCK ON! Volunteer Match If Libraries aren’t your thing, find something that is!